Researchers from CIC nanoGUNE (San Sebastian, Spain) and collaborators have reported in Science the development of a so-called hyperbolic metasurface on which light propagates with completely reshaped wafefronts. This scientific achievement toward more precise control and monitoring of light is highly interesting for miniaturizing optical devices for sensing and signal processing. Optical waves propagating away from a point source typically exhibit circular (convex) wavefronts. "Like waves on a water surface when a stone is dropped," says Peining Li, EU Marie Sklodowska-Curie fellow at nanoGUNE and first author of the paper. The reason for this circular propagation is that the medium through which light travels is typically homogeneous and isotropic, i.e., uniform in all directions. Scientists had theoretically predicted that specifically structured surfaces can turn the wavefronts of light upside-down when it propagates along them. "On such surfaces, called hyberbolic metasurfaces, the waves emitted from a point source propagate only in certain directions, and with open (concave) wavefronts," explains Javier Alfaro, Ph.D. student at nanoGUNE and co-author of the paper. These unusual waves are called hyperbolic surface polaritons. Because they propagate only in certain directions, and with wavelengths that are much smaller than that of light in free space or standard waveguides, they could help to miniaturize optical devices for sensing and signal processing. Now, the researchers have developed such a metasurface for infrared light. It is based on boron nitride, a graphene-like 2-D material, which was selected because of its ability to manipulate infrared light on extremely small length scales. This has applications in miniaturized chemical sensors or for heat management in nanoscale optoelectronic devices. The researchers directly observed the concave wavefronts with a special optical microscope. Hyperbolic metasurfaces are challenging to fabricate, because an extremely precise structuring on the nanometer scale is required. Irene Dolado, Ph.D. student at nanoGUNE, and Saül Vélez, former postdoctoral researcher at nanoGUNE (now at ETH Zürich) mastered this challenge using electron beam lithography and etching of thin flakes of high-quality boron nitride provided by Kansas State University. "After several optimization steps, we achieved the required precision and obtained grating structures with gap sizes as small as 25 nm," Dolado says. "The same fabrication methods can also be applied to other materials, which could pave the way to realize artificial metasurface structures with custom-made optical properties," adds Saül Vélez. To see how the waves propagate along the metasurface, the researchers used a state-of the-art infrared nanoimaging technique that was pioneered by the nanoptics group at nanoGUNE. They first placed an infrared gold nanorod onto the metasurface. "It plays the role of a stone dropped into water," says Peining Li. The nanorod concentrates incident infrared light into a tiny spot, which launches waves that then propagate along the metasurface. 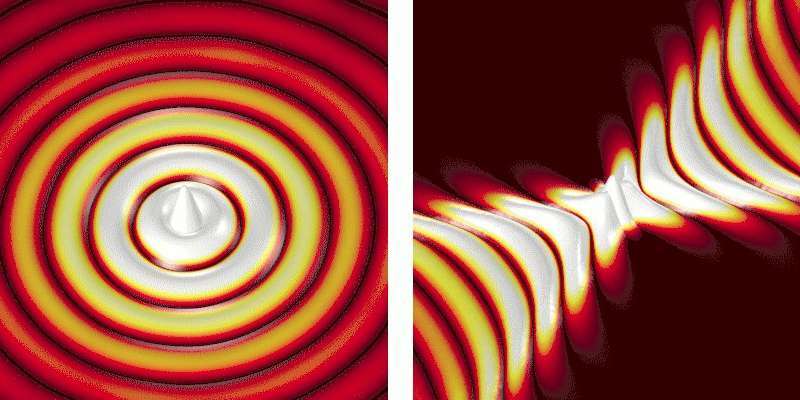 With the help of a so-called scattering-type scanning near-field microscope (s-SNOM) the researchers imaged the waves. "It was amazing to see the images. They indeed showed the concave curvature of the wavefronts that were propagating away form the gold nanorod, exactly as predicted by theory," says Rainer Hillenbrand, Ikerbasque Professor at nanoGUNE, who led the work. The results promise nanostructured 2-D materials to become a novel platform for hyberbolic metasurface devices and circuits, and further demonstrate how near-field microscopy can be applied to unveil exotic optical phenomena in anisotropic materials and for verifying new metasurface design principles. So can it carry data? What good is it exactly? Well if we could design materials on the Atom per Atom level (cheaply and reliably) we could design circuits for light to travels as plasmons throughout a circuit at wavelengths below normal free space EMR waves. I find it fascinating how "normal" light can "disappear" and form plasmons to only RE-APPEAR later as light again. In a way, this is a bit like PILOT-WAVE theory. The EMR interacts with the electrons of the atoms in the surface, which then interacts back with the EMR to guide and shape its behaviour. Now before you all smack me down, have a think about it. How much energy would a particle accelerator need to make a viable black hole? By viable, I mean a mass that would not just instantly evaporate into Hawking radiation, and would be capable of growing in an appropriate medium. Thesis anyone? At least Planck energy, or 1.22*10^19 GeV. LHC operates up to 1.3*10^4 GeV. Energy is The Key ! Not only Factories of Future SHOULD HAVE Near 100% FREE Energy, but also HUMANS (If not in next decade, century OR Millennium) just like we are using CHEAP CHINESE LABOR Via Our Walmart Shelves as Brokers ! ALL ORGANISMS, INCLUDING Us are/were UNICELLULAR At one time. Take Amoeba that consumes smaller Microorganisms. TAKE our Amoebae-Like White Blood Cells in OUR OWN Blood Stream that keep our Blood Germ-Free. So, Turn Amoeba etc., to use Sun like other Unicellular Plants (Ex: Yeast, Algae(if not all) etc). One-Century, One-Millennium in the Future...Our SKIN SHOULD MAKE FOOD for our Bodies like it already synthesizes D-Vitamin for us without any need for a separate pharmaceutical factory or Walgreens-CVS etc., I know ALL Restaurants will have to shutter then, being replaced by More Universities offering Doctorate Degrees!